Tune in tonight at 10 pm to Brooklyn Independent Television to catch photographer and ATZ contributor Barry Yanowitz on Caught in the Act. The entire segment was shot in Coney Island, where Barry grew up and lived until graduating from college in 1995. The shots that we’ve reproduced here, including the above “accidental” double exposure, are among the photos he took during the shoot. The complete set may be viewed here. We first met Barry in Coney Island and began following his photos on flickr back in 2008. Among our many faves are Astro Cat (Coney Island in the Snow), a Mermaid Parader and the reflection of Luna Park’s lights on top of a car (City of Fire). 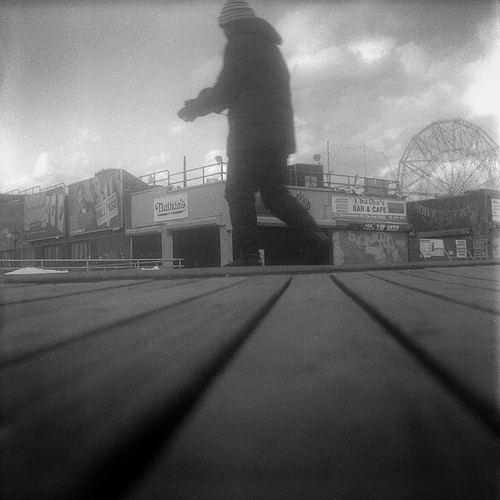 Barry Yanowitz: A stroll on the boardwalk with this photographer, who uses both the latest digital equipment and a Kodak Brownie from half a century ago. His images reflect his love of the Coney Island he grew up in, and his fascination with how the water and light reflect the way it’s changing. BCAT TV Network cablecasts in Brooklyn on Time Warner channels 34-35, and 56-57, Cablevision channels 67-70, RCN channels 82-85 and Verizon channels 42-45. For people outside of Brooklyn, go to BCAT’s website and launch channel 3. After the episode premieres, it will be rebroadcast on Mondays and Wednesdays at 2 pm and 10pm and may be viewed online. The segment is between 5-10 minutes and will be aired in an episode that also features Punk Jews and the LIU Television Writers Studio. Produced by Jonathan Lief and Irina Khokhlova, Caught in the Act: Art in Brooklyn is a monthly show featuring profiles of Brooklyn professionals in fine art, dance, music, theatre and new forms of expression. You’re welcome,Barry. Just launched channel 3 to watch it on the web. Happy to know I can “tune in” since I don’t have cable!